Teeth whitening is the number one most popular cosmetic dental treatment in the U.S.. It is a non-invasive procedure that improves the color of your teeth. Teeth whitening is considered extremely safe. Over the counter and take-home whitening kits contain very low doses of whitening agent that are safe to be used by non-professionals, although we do advise that you only use over-the-counter kits that have been endorsed by the American Dental Association (ADA). You should also ensure that take-home trays are provided by licensed, professional dentists. If you are choosing to have your treatment done in-office, then you should ensure that you select a qualified dentist who is experienced in teeth whitening procedures. What stains can I expect teeth-whitening products or services to remove? What stains won’t be removed by teeth whitening products or services? Are there any groups of people who are not suitable candidates for teeth whitening? What sort of results can I expect to see? The results of teeth whitening can vary dramatically, and are largely affected by your age, lifestyle and genetics. Over-the-counter and take-home whitening kits do not produce a result as strong or as long-lasting as in-office treatments. 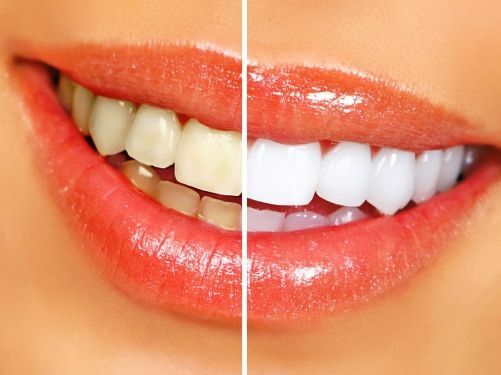 Depending on the type of teeth whitening you choose, you can still expect your teeth to lighten by as few as two and as many as twelve shades. How long does an in-office teeth whitening procedure take? After your initial consultation, you can expect in-office teeth whitening to take between one and two hours to complete. The exact time will depend on the extent of staining to your teeth, and the amount of exposure to the cleaning chemicals that is needed. If the desired result is still not reached, your dentist may recommend either a take-home tray of additional treatment, or follow up procedures in the office. However, the majority of patients will see dramatic results instantly. If you opt for over-the-counter or take-home whitening kits, you can expect to spend at least two weeks using your equipment overnight. On average you can expect to have whiter teeth for 6 to 9 months after your teeth whitening procedure. However, the length of time that you maintain your result is largely down to your age and lifestyle choices. Good oral hygiene is essential for looking after both the health and whiteness of your teeth, and using products such as whitening toothpaste and mouthwash can support your brighter smile. Smoking and drinking/eating products containing tannins are some of the main causes of stained teeth, so avoiding these as much as possible will help to prolong your results. Teeth whitening requires the use of chemicals in the whitening agent, and sometimes these chemicals can cause irritation or tooth sensitivity. If you experience any pain or discomfort during any form of teeth whitening treatment it is advisable to stop immediately and ask your dentist for advice. There are a large variety of options when it comes to whitening your teeth. These range from over the counter solutions which can cost as little as $10, up to in-office professionally handled treatment which can cost as much as $1000. Please check out our page on the cost of teeth whitening for more information.